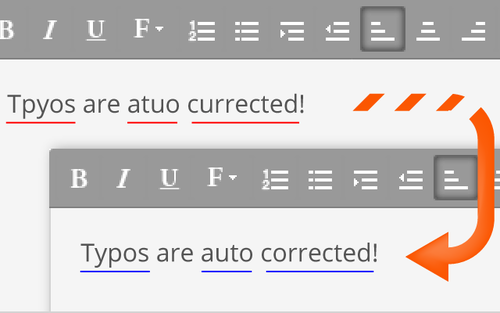 With Textbox.io, your typos are auto corrected (typos are auto corrected). When you enter a word that matches one of our 4,000 commonly misspelled words, the Textbox.io editor immediately replaces the misspelling with the intended word. You’ll know its working when you see (briefly) a small blue line underlining something you’ve typed. We think we will have it right 99% of the time, but if there is an “autocorrect fail” you can undo the action with COMMAND + Z.